Cheese plates are a mainstay of holiday party appetizers, but finding new ways to zhuzh up the usual suspects can be a challenge. 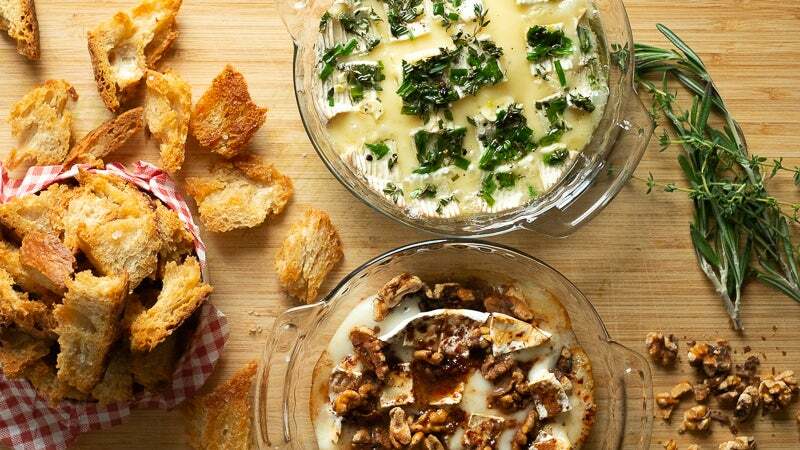 Allow me to introduce you to your new best friend: baked cheese. 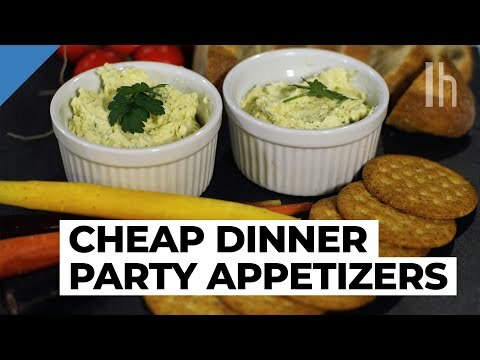 Video: Opening up your house to a bunch of hungry friends can be quite fun, but you can quickly rack up some pricey party expenses if you're not careful. But there are a lot of ways to serve fancy food without draining your bank account, and we're going to show you how. Like fromage fort, baked cheese combines the best of all possible party-snack worlds: cheese, ease, and whatever you have lying around your fridge. All you have to do is cut a shallow cross-hatch pattern in a wheel of soft, rinded cheese, stuff with tasty morsels of your choice, and bake at 180ºC until melty. A tiny cast iron skillet wins extra points for presentation, but you can also bake the (unwrapped) cheese directly in its wooden box packaging; either way, place them on a sheet pan for better heat conductivity and drip protection. Serve your delicious creation alone—with plenty of dippable carbs— or as the pièce de résistance of a killer cheese board. To show you the range of this technique, I made two different flavours: one savoury, one sweet. 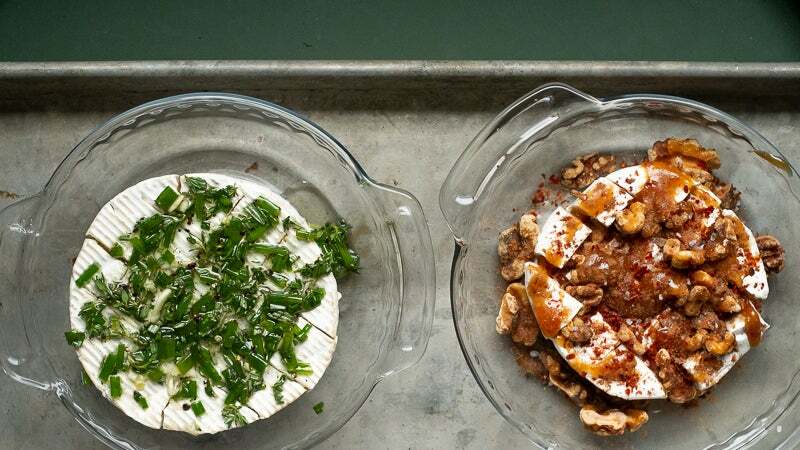 For savoury, I stuffed Camembert with thinly sliced garlic cloves and drizzled it with herby olive oil; for sweet, I doused a cute lil’ wheel of goat brie with honey, toasted walnuts, cinnamon, sea salt, and Aleppo pepper flakes. They were ready in less than half an hour total, and since all the flavourings came from my fridge or pantry, I just had to buy some cheese. Slide sliced garlic right into the slits. 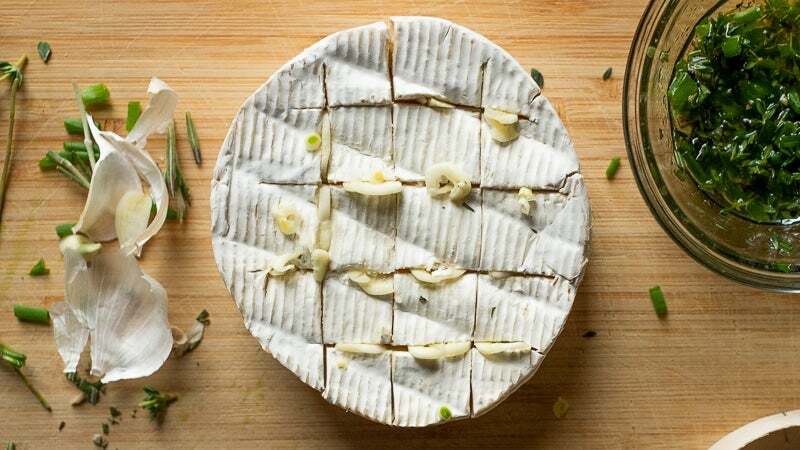 Garlicky Camembert and sweet-and-spicy goat brie are just two directions you could take this. Any soft cheese with a rind will work, as will just about any flavoring agent you have kicking around. Caramelised onions and thyme would make something like French onion fondue; a spoonful or two of fruit preserves turns a wheel of brie into cheesecake dip; hell, throw some shredded cheddar, pimentos, and hot sauce on there. 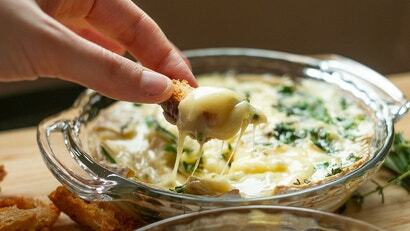 Follow your heart—there’s no wrong way to eat liquid cheese.